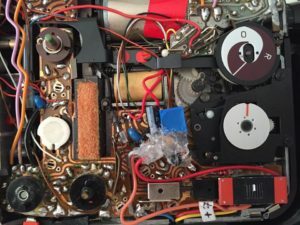 Loads of Braun Nizo super 8 camera owners, especially of the 400, 500 and 800 series have the problem of not being able to get their hands on 2 button cell batteries of 1.35V each. Together feeding the light meter circuitry with 2.7V. 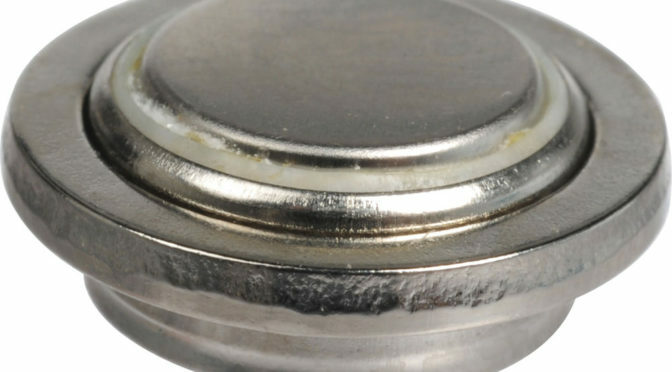 The original PX625 Mercury button cell batteries aren’t produced anymore, I guess for environmental reasons. They provided a 1.35V voltage. Nowadays the 625 batteries provide 1.5V. The problem is that we have had quite some reports of owners using 2 cells of 1.5V each, thus providing 3Volts to the circuitry. This would give different light meter results so ideally one finds a way to provide 2.7V to the circuit without having to worry about button cell batteries in the Nizo. There are quite a few solutions to the problem, such as using more environment friendly Weincell batteries (Zinc-Oxide), that do provide 1.35V but are quite expensive and tend to die rather quickly if not properly stored. Other solutions involve using Zener diodes and creating adapters from PX625 batteries that hold the zener diode and can house a smaller cell battery. 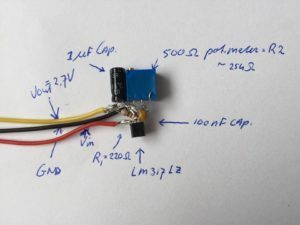 Do connect this circuit to some power source like a 9V battery and adjust the trimmer such that you can measure 2.7V at the yellow output lead (use a multimeter). When done correctly the side cover will just be able to still fit and you can screw it back on with the 4 screws. Do not forget to remove any remaining 625 button cell batteries from the camera or you can get failures. Then, switch on the power of the Nizo and test the light meter by pressing the appropriate button and you will see a perfect indication of the meter on the number ‘8’ of the light meter. Currently we are exploring a different way to add this circuit to the Nizo camera and that is to solder it together just tight enough that it will actually fit within the original button cell housing. One would have to take out the metal strip at the bottom of that housing, then 2 little holes are available. Through one of these holes one can put GND and Vin leads (have to be soldered to the right contact points within the camera, and the 2.7V output lead can be guided into the camera using the other hole. This method will be tested and instructions and pictures will be provided in a next post.